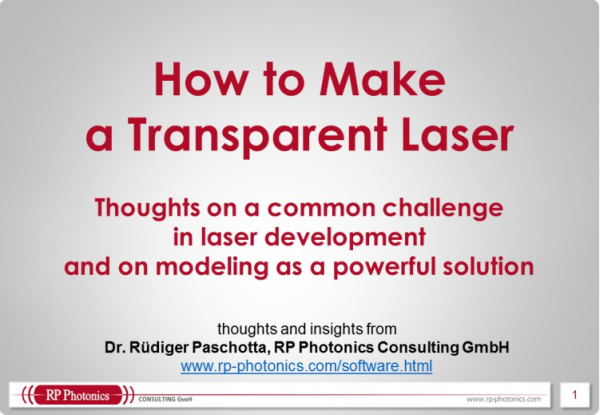 R. Paschotta, article on “lasers” in the RP Photonics Encyclopedia, URL https://www.rp-photonics.com/lasers.html. Use a browser bookmark in order to get it with a single click. Tell your colleagues, customers or students about this source of information. Place a link on your own site. You can get the required html code here. Note that you can use the encyclopedia for citations in your printed and online articles. The encyclopedia and their articles (including their URLs) are considered as permanent and thus citable (see the box on the right-hand side). Links to specific articles can serve e.g. as definitions for terms. This can be attractive e.g. when you are writing a newsletter: give your readers a chance to get supplementary information. If you would like to use any materials of the encyclopedia (text or figures) in a publication (e.g. a book, journal, scientific article, conference presentation), please contact RP Photonics. Usually, you can get such a permission if you are willing to clearly identify the origin of the materials. RP Photonics may also provide modified versions of figures, e.g. with higher resolution or different parameters. Provide RP Photonics with feedback, e.g. concerning corrections and additions. Place an advertisement for your own company on the gray bar at the right-hand side. … and if you need any help on the topics of this encyclopedia, consider to use the consulting services of RP Photonics Consulting GmbH! There is a variety of various services available in topical areas such as lasers, laser amplifiers, nonlinear optics, fiber optics, ultrashort pulses, multilayer mirrors, noise and fluctuations, and other topics in photonics and optoelectronics.